If something looks easy to cheat on it doesn’t mean that cheating is occurring. Lets say the IRS next year completely disbanded its army of auditors. That would not immediately lead to massive tax fraud. Some of us pay our taxes because we love to, not because we are forced to by threats of financial ruination and prison time if we get caught. Some of us do not sin, even though we have no God to believe in, either. But then, corporations have no morals, and their only goal is to make a profit. For them, lying, cheating and stealing have no chance of leading them either to prison or to Hell. Warner, Melanie (2013-02-26). Pandora’s Lunchbox: How Processed Food Took Over the American Meal (p. 107). Scribner. Kindle Edition. A food science company develops a new revolutionary new food chemical. They need it to be safe so they can start marketing it for human consumption. They put together a panel of experts to review it’s safety. That panel green-lights it’s safety and they inform the FDA that the new product is safe. To me, this seems like a system like an audit-free IRS. Warner, Melanie (2013-02-26). Pandora’s Lunchbox: How Processed Food Took Over the American Meal (pp. 107-108). Scribner. Kindle Edition. So here we have a voluntary process of testing safety, where the safety is reviewed by a ‘panel’ of experts who ‘should’ be trained in science and have experience. These experts will be paid and evaluated by the company who they are themselves evaluating. Tom Neltner, the chemical engineer who’s leading Pew’s food-additive project…counted eleven instances out of 410 of an expert “panel” of one and knows of a single person who has served on 185 different panels. “That person may have done a wonderful job and he may have been picked because he’s the most responsible, but it raises a lot of questions,” said Neltner. The FDA has the ability to respond to and effectively derail such paltry evaluations, but when it does, companies are first given the opportunity to withdraw their notification. Neltner identified thirty-one such withdrawals since 2001. What’s allowed to happen next is even more remarkable. Companies can either drop the ingredient (unlikely), do additional investigations in order to resubmit to the FDA, or simply go the abracadabra, ghost-additive route— declare the item safe and start selling it. Pew has found numerous instances of this. Warner, Melanie (2013-02-26). Pandora’s Lunchbox: How Processed Food Took Over the American Meal (pp. 108-109). Scribner. Kindle Edition. IF the FDA balks at your panel of experts’ review, you can withdraw your “notification letter” and drop your ingredient, or investigate your ingredient some more, or JUST DECLARE THE INGREDIENT SAFE. If all of your competitors are doing it, Generic Food Science Corp, you would be guilty of Corporate Malfeasance against your stockholders to not do likewise. It is your corporate duty to take full advantage of any advantage your rivals are taking. It is not evil. What these companies are doing is PERFECTLY LEGAL. 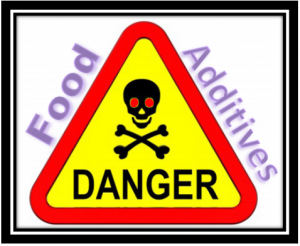 Like I said earlier, just because it would be very easy to accidentally put on the market a food additive that is in fact very dangerous to some people, that does not mean that it has ever happened. Well, maybe trans fats were approved in error. Now that I think of it, Aspartame artificial sweetener is also currently approved but is dangerous… I know people personally who have issues with various artificial colors added to foods. I could go on, and on, and on, and on… There are currently things added to our foods that would not be approved if they were drugs. Our FDA is not protecting us. The good news is that none of the foods that they are putting all of these untested ingredients in is required for life. You can go days, weeks, moths, years without ever eating a processed food. I do it (eat processed) for fun, but I never do it for convenience any more. Saving time is not worth it. If I am on the road I will have to eat something processed because I am not preparing my own food on the road. I will, from time to time, binge out on snacks, sweets or drinks. By and large, though, I only eat foods that I know where they are from, and I know how they are prepared, because I did it myself. Maybe you think my life is something you don’t have the time or money to recreate in your own life. Well, you can’t really use time as an excuse, because I work loads of hours and so does the wife. As far as money goes, people that eat like me end up eating less pounds of food, because there is so much energy in the fats that we eat. You, if you are eating processed carbohydrates, are eating far more often than I am, because your carbs make you feel hungry as soon as the sugars in them are out of your blood. I eat at breakfast, lunch, and dinner, and I don’t eat all that much. Nobody in your government is currently watching what goes into your processed food. Eat manufactured food at your own risk. This entry was posted in Health, Living and tagged FDA, generally regarded as safe, GRAS, Melanie Warner, Pandora's Lunchbox. Bookmark the permalink.